Several examples of first prefix number 000001 notes are known among the Ploughman notes. 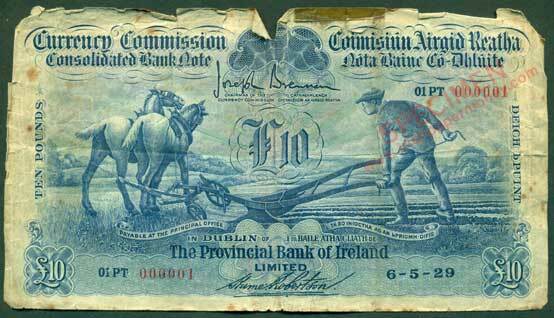 The latest example to be recorded is Provincial Bank of Ireland £10 note PT01 000001, pictured below. It is likely that all of the first prefix number 000001 £1, £5, £10 notes of each bank were retained in 1929. In time, others may also turn up. Great to see an example of another No.1 note. I imagine that most were framed for display purposes. However, this one seems to show signs of wear and tear. It is a shame that examples of denominations higher than £10 were not retained ! Indeed. The higher denominations were issued later, and in some cases much later or not at all, the novelty may have passed by then! That's a nice one to find! A pity about the grade. I guess the 1 and 5 pounders would also have survived somewhere. I just got a scan of the reverse of the note, which suggests that it was in circulation, rather than just having been damaged by storage. 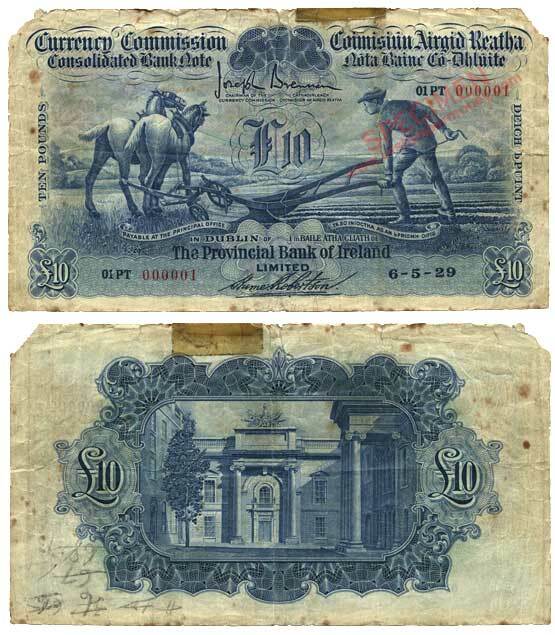 The sum on the reverse suggests that the note was paid into a bank and spent some time as part of a pile of old notes, to be withdrawn from circulation. Once the amount of notes in the pile was high enough to be remitted the notes would be sent for destruction. As the pile of notes was added to, the sum was updated. Some interested person must have saved the note at some stage! This is interesting, in that if correct, it would indicte that some of the first run of Ploughman notes were not kept for archival purposes and entered normal circulation. There were only eight Ploughman number 000001 Ten Pound notes printed!